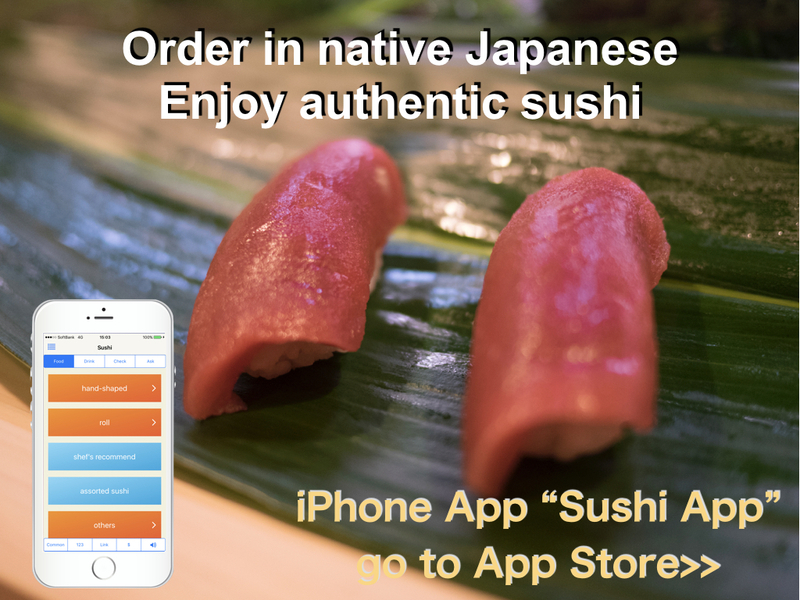 Nikujaga is a very popular home cooking food. One interesting thing is which meat (beef or pork) will be cooked depends on region. Around Tokyo area, people are cooking pork. But around Osaka area, people are cooking beef. 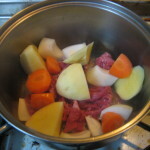 I grew up in Kobe, around Osaka area, so I am cooking it with beef. First time I came to Tokyo, I was surprised that I saw “pork Nikujaga”. 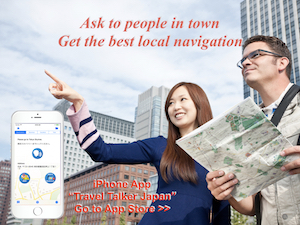 I thought it was not Nikujaga, maybe different food…. There seems to be several story about birth of this food. According to Wikipedia, when the general Heihachiro Togo (1848 – 1934. Japan Navy) studied in U.K., he found beef stew and loved it. After that, he returned to Japan and asked chef of warship to cook beef stew. 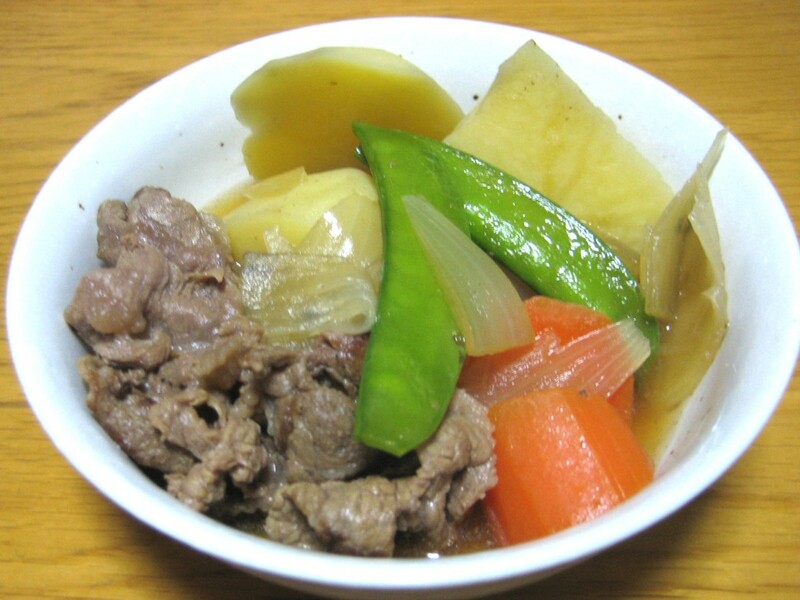 But chef had never had beef stew and had no idea… He cooked “Nikujaga” with using beef, potato and soy sauce. 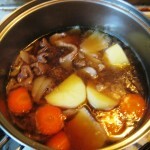 But it is said that beef stew was already known in Japan at that time. So some people are saying the above story is fiction. Now it is very popular and basic home cooking food. It seems to be popular food since 1960 or 1970. 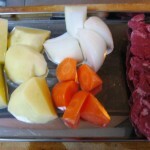 It is the same period when beef curry and those ingredient, beef and potato, became widespread. 1) Cut carrot and onion as bite size, and cut both edge of split pea. Cut potato bigger than bite size. 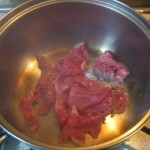 2) Pour cooking oil in a pan and bake beef. Then put vegetables exclude split pea in a pan. 3) After a while, put all sauce ingredients in the pan and simmer until potato becomes boiled. Put split peas. You may be noticed that this ingredients are as same as beef curry. And cooking method is similar to it. The difference is sauce. I said before, Nikujaga is a very popular home cooking food now. That means there are tastes and recipes as much as home.